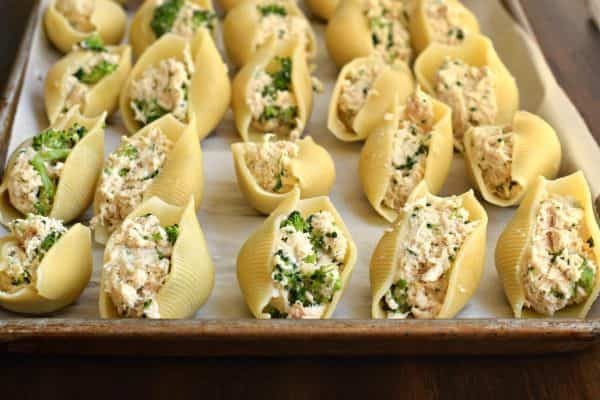 You’ll love these easy, freezer friendly Chicken Alfredo Stuffed Shells. 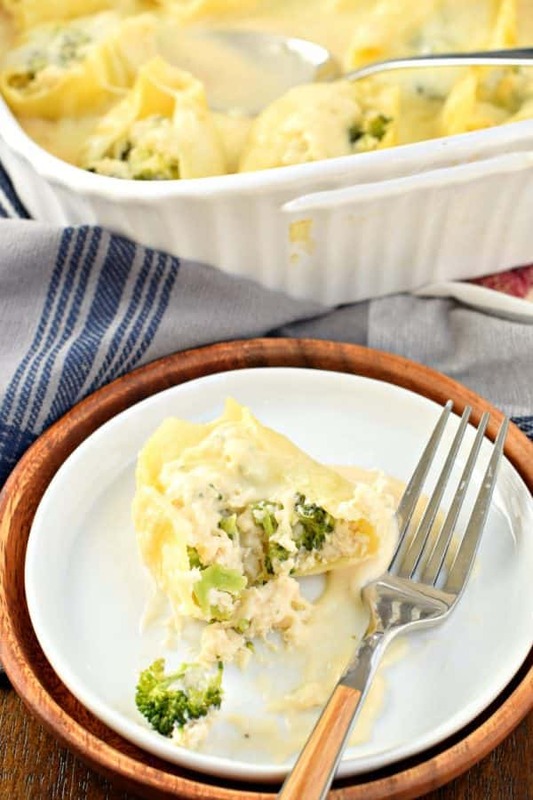 The perfect weeknight dinner recipe with chicken, cheese, broccoli and alfredo sauce all stuffed in a pasta shell! I’m going to teach you how to make an easy weeknight meal in a few easy steps. Including a freezer friendly version for these Chicken Alfredo Stuffed Shells! But first, can we talk grammar? There are probably many instances on this blog where I have written NUMEROUS grammatical errors. Perhaps I’ve already done so in this post. Many of you take the time to let me know, which is no biggie to me. I usually don’t fix them, but if you want to send me emails and comments that’s up to you. Unless it is in my recipe card below, I tend to let it slide. Sorry. But my 13 year old daughter takes it one step further. You see, in her Language Arts class her teacher wants them to provide examples of grammatical errors. In return, they get a piece of candy. They can show up to 5 examples a day. Now, how about these pasta shells? 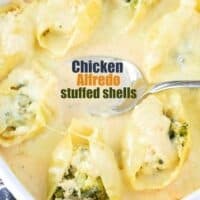 These easy, delicious, make ahead Chicken Alfredo Stuffed Shells!! Make shredded chicken ahead of time. Put some frozen chicken breasts or thighs in your crockpot for 6-8 hours on low with a little salt and pepper (no liquid). Take your hand held mixer and “shred” your chicken in SECONDS. (It’s seriously that easy). Use a 2 Tbsp metal cookie scoop to portion out your filling into the shells. This is such an easy way to evenly fill each pasta shell! Once all your shells are filled, place them on a cookie sheet and freeze them for 15-30 minutes. At this point you can place them into gallon sized ziploc bags that are labeled with directions for future dinners. Unless of course your family can consume 40 stuffed shells in one sitting! 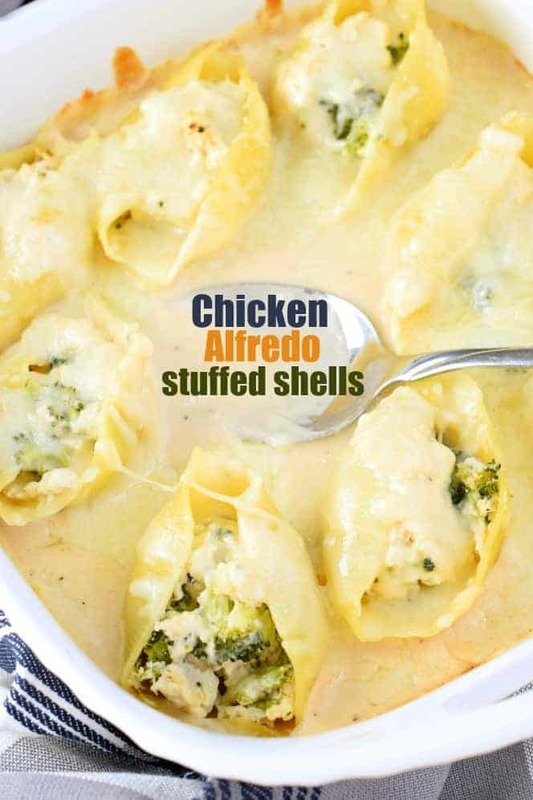 We eat about 2-3 shells per person as they are very rich and filling with the alfredo sauce! Serve this with garlic bread and a leafy green salad for a complete meal. 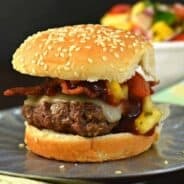 This makes a great dinner to bring to a new mom too! Package up a ziploc with shells, bring her a jar of sauce and some frozen garlic bread. She can assemble and bake as directed when she needs a quick meal! I’m a big fan of alfredo sauce. 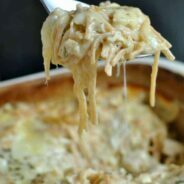 This Instant Pot Chicken Alfredo recipe is made often in our home! It’s so fast, and so creamy, I think you’ll love it too! Creamy, Sausage Alfredo Pasta is a quick and versatile dinner recipe that is on the table in under 30 minutes! If you love Stuffed Shells, then this Cheesy Sausage Stuffed Pasta Shells recipe is for you. 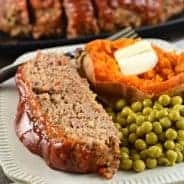 Perfect for a freezer friendly meal option. 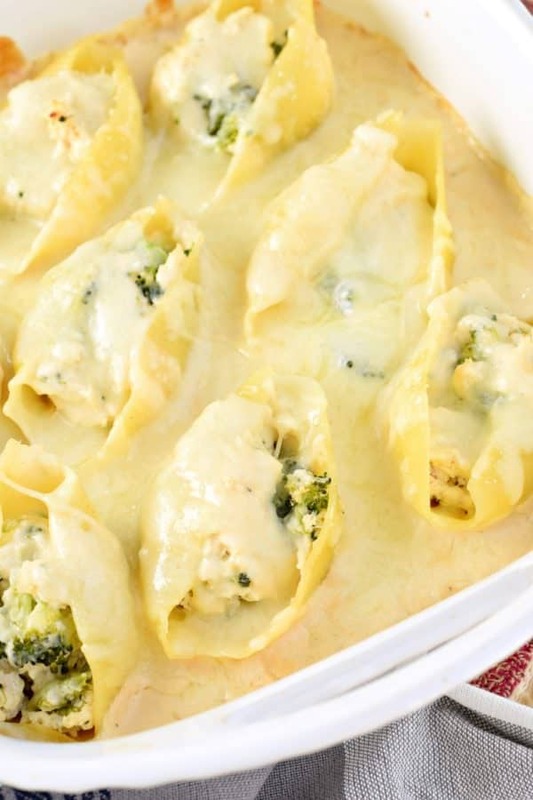 Stuffed Pasta Shells with Chicken, Broccoli, Cheese and smothered in Alfredo sauce! You'll love this easy, freezer friendly, weeknight dinner recipe! Cook pasta shells according to package to al dente. Drain and set aside. In a large bowl, combine cooked, shredded chicken with broccoli, cream cheese, garlic, salt, and pepper. Mix until well combined. Using a 2 Tbsp cookie scoop, fill each pasta shell with a scoop of chicken mixture. In a large baking dish, pour one jar of alfredo sauce in the bottom of the dish. Add a single layer of pasta shells. Drizzle remaining jar of alfredo sauce over the top and sprinkle with parmesan and mozzarella cheese. Cover dish with foil. Bake in a 350°F oven for 40 minutes. Remove foil and return to oven for an additional 5-10 minutes until cheese is melted on top! For freezer friendly option, complete steps 1-3. Once all the shells are stuffed, place them on a cookie sheet and freeze for 15-30 minutes. Remove from freezer and place in gallon sized ziploc bags and return to freezer until ready to make. Continue with step 4 when ready to make and bake for one hour with foil on top. Remove foil and return to oven for additional 5-10 minutes to melt cheese. I love Alfredo anything, but combine it with chicken and broccoli and you’ve got…winner, winner chicken dinner! Great freezer meal too. LOVE having a bag of these shells in my freezer for a meal down the road! You daughter sounds like a very intelligent kid! 🙂 What a yummy dish! Oh man! I feel like that’s one of those moments where you’re simultaneously proud of your child and also seriously annoyed 🙂 These shells look amazing and I love that you can freeze them… Pinned! yes. 🙂 Thanks for pinning!! What size jars of sauce? Does this work with homemade alfredo sauce? I’ve found that reheating homemade alfredo (cream, butter, parm) can often turn into a greasy pool of oil. A 1/2-1 teaspoon of cornstarch sometimes helps to bind the sauce. Do you think it would reheat okay? I never did Chicken alfredo until now even if I love it when I`m at the restaurant :). I will make it tonight for my family. Thank you. should I use fresh or frozen broccoli? Since it’s not cooked before it goes into the shells, I would assume frozen? I used fresh. If you use frozen, you will want to thaw it so that you don’t have the extra moisture in the pasta.